Just Romantic Suspense: Print book, ebook, audiobook – What’s Your Preference? Print book, ebook, audiobook – What’s Your Preference? Congratulations to "Lynn R.", the winner in Jacki's giveaway. Thank you to all who participated! Have you ever wondered why you prefer one book format over another? Pondered why a book seems so much more enjoyable when you read a print version as opposed to the digital version? Tried to figure out why some people adore audiobooks and others don’t? Believe it or not, your format preference is motivated by a number of interesting factors. Here’s what research and scientific theory have to say about why readers prefer different book formats. A 2011 survey revealed different buy vs. borrow rates for book formats. Between 54% and 61% of print and ebook readers preferred to own copies of books, compared to just a third of audiobook listeners. Of the 61 percent of audiobook borrowers, those with library cards were more likely to borrow instead of buy copies. Many people assume that young readers prefer ebooks, which can be accessed on digital devices, but research contradicts this assumption. A survey of 16-24-year-old readers indicated more than 60% preferred print books, most who said they liked holding a book in their hands. People process information differently Educators recognize seven learning styles. A person’s (combined) learning style can influence which book format they prefer. · Visual (spatial): Preference for pictures, images, and spatial understanding. · Aural (auditory-musical): Preference for sound and music. · Verbal (linguistic): Preference for words, both in speech and writing. · Physical (kinesthetic): Preference for body, hands and sense of touch. · Logical (mathematical): Preference for logic, reasoning and systems. · Social (interpersonal): Preference for groups or with other people. · Solitary (intrapersonal): Preference for being alone and self-study. Some research has been conducted on how personality traits impact entertainment preferences. The theory is that different types of content fulfill different psychological needs, such as mood, attitude and disposition. Lifestyle undoubtedly influences what format readers prefer. One Reddit discussion thread demonstrates this in an example provided by WoodensBeard who wrote about having time in his late teens to “read books ad nauseum,” but later in life did not have space for storing books nor time to read them so he’d turned to audiobooks, listening while cooking, cleaning, traveling and using his computer. People who prefer print books like the tactile sensation of reading, such as the weight of the book, the sound and sensation of flipping pages and the scent of books. They also enjoy the visual component of full bookshelves, catching sight of favorite titles/authors and the imagery of covers. People who prefer ebooks are motivated by practical concerns such as cost and convenience. People who prefer audiobooks like the convenience and accessibility, as well as the auditory “storytelling” component. Authors know readers have difference preferences, which is why so many deliver their books in all three formats. When one of our primary goals is to connect with new readers, offering print, ebook and audiobooks amplifies our opportunities to do so. What book format do you prefer and why? Do you prefer a single format or all three? 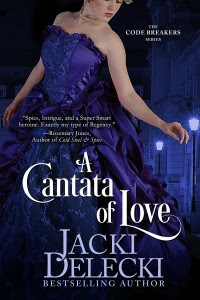 Comment here for a chance to win a copy of my latest release, A Cantata of Love. You can pick the format of your choice! Napoleonic France is no place for an Englishman, especially Michael Harcourt, the Earl of Kendal, who is on a clandestine assignment for the Crown. Already injured and facing imminent discovery by Napoleon and Fouche's men, Michael finds his escape made even more perilous when he is charged with the safety of a young boy who must be spirited out of Paris. Desperate to escape the terrible fate that awaits her if she remains in France, Lady Gabrielle De Valmont must disguise herself as a boy and rely on the cunning of a virtual stranger - an Englishman, no less - to smuggle her out of the country. When the Earl's injury becomes severely infected, rendering him gravely ill, Gabrielle realizes it is now up to her to save them both. 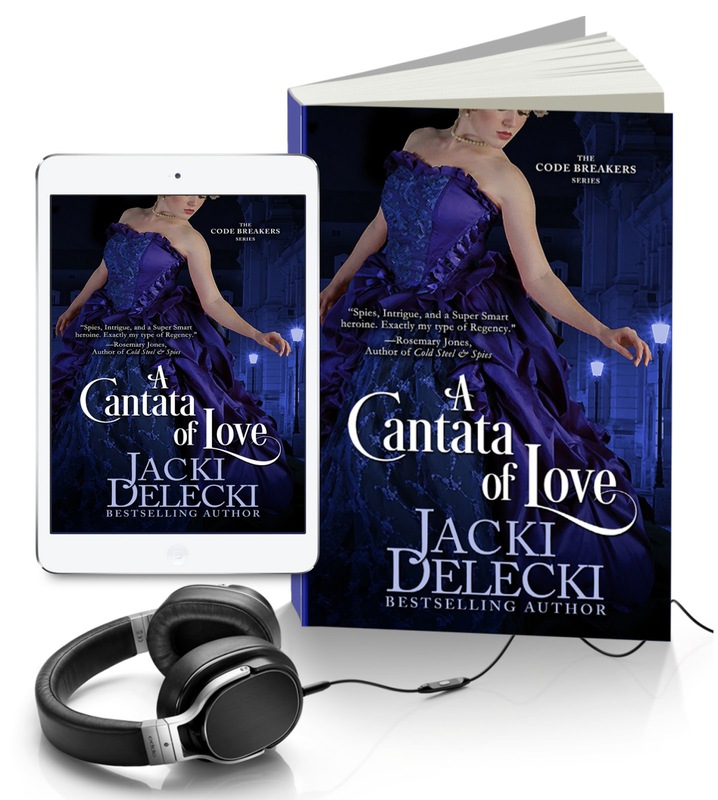 Jacki Delecki is a bestselling romantic suspense writer. Delecki’s Grayce Walters Series, which chronicles the adventures of a Seattle animal acupuncturist, was an editor’s selection by USA Today. Delecki’s Romantic Regency The Code Breaker Series hit number one on Amazon. Both acclaimed series are available for purchase at http://www.JackiDelecki.com. Follow her on FB—Jacki Delecki; Twitter @jackidelecki. Giveaway ends 11:59pm EST Sep. 27th. Please supply your email in the post. You may use spaces or full text for security. (ex. jsmith at gmail dot com) If you do not wish to supply your email, or have trouble posting, please email maureen@justromanticsuspense.com with a subject title of JRS GIVEAWAY to be entered in the current giveaway. I prefer Ebooks. I do like print but I like the cost, convenience, and storage of the ebook. I prefer print -so much easier to flip back to reread an earlier scene and to share books with friends. I like all three. It depends on the book in many cases. I like Ebooks because they don't take up physical shelf space and I can easily take them with me...especially now that there are apps for my phone and tablet. But I still like reading a print book, especially for ones I think I'll want to share with others or go back and reread. Or if it's the type of book where you'll want to flip back to the beginning to check stuff out. And audio books are great for long car trips. I find I can't listen and do much else cause I get too distracted from the story and miss what's going on. All have their place! I like Ebooks the best. It's the instant buying gratification that works for me. I can buy a book and start reading it at 2am if I want. When I finish it, I can instantly pick out another. I'm trying to get into audiobooks, but I just get so distracted. It's hard to concentrate for the nine million hours it takes to finish one little book. I will always prefer a hard copy. It's easier on the eyes for one & it just feels right. I like audiobooks to do my housework. BUT, there is nothing like holding a book in my hands! I really only want to read print books.